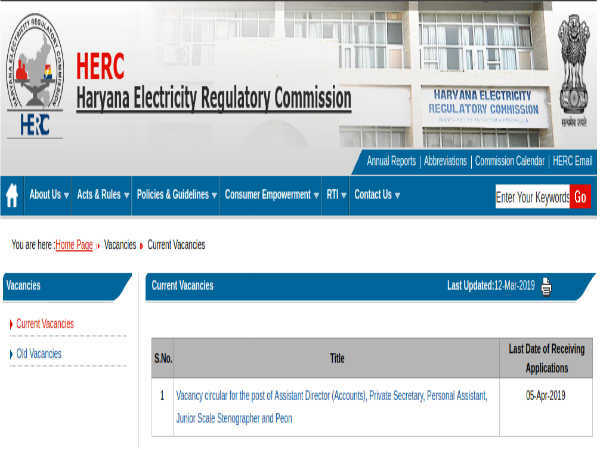 The Haryana Electricity Regulatory Commission (HERC), under Govt. of Haryana, has invited applications in a prescribed format from eligible candidates for filling 15 vacancies to the post of Assistant Director, Private Secretary, Personal Assistant, Stenographer and Peons either through direct recruitment or absorption or on deputation basis as per the HERC guidelines. The offline application process towards the same starts from March 08, 2019 and closes on April 05, 2019. Desirous candidates applying for the post of Peons, Stenos and Assistants through HERC Recruitment 2019 must have passed Class 10th/SSC, Class 12th/HSC and possess B.Com Degree, Graduation, Diploma/ITI in Stenography in English/Hindi and Ph.D in Commerce/Finance Management from a recognized Board/University/Institute. The selection of candidates as Peons, Stenos and Assistants through HERC Recruitment 2019 will be done based on Shortlisting, Written Test, Skill Test and Interview as applicable.